Like all insects, caddisflies have 6 legs, 2 antennae, and 3 body parts. 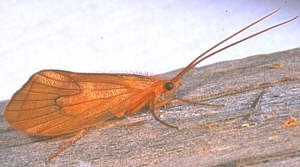 Adult caddisflies resemble moths, with hairy wings and long antennae, but caddisflies do not have the long siphoning mouthparts that butterflies and moths have. Caddisflies hold their wings tent-like over their bodies when they are not flying. Like stoneflies, mayflies, and dobsonflies, immature caddisflies are aquatic, living in streams and lakes. Caddisfly larvae look similar to the larvae of mayflies, aquatic beetles, and other aquatic insects, but can usually be distinguished by the presence of a "case." Most caddisfly larvae construct and live in a protective case made from small pebbles, twigs, or other debris. The larvae build these cases using silk produced from glands in their moths. SIZE: Body length of larvae up to 1 1/2" long; adults up to 1". Caddisflies have complete metamorphosis. After hatching from eggs, young caddisflies live underwater for a few months to several years, depending on the species, before finding a hiding place to pupate. The pupal stage lasts for the winter and early spring, after which the winged-adult caddisflies emerge. The adults typically live for about a month, just long enough to mate and lay eggs. Adults usually stay close to the water, and adult females lay eggs on or in the water (females of some species will dive underwater to lay eggs). Some females will lay up to 800 eggs. Like many aquatic insects, caddisflies live most of their lives in the larval stage, often 1 or 2 years. All caddisfly larvae are aquatic, and most are found under rocks in fast-running streams. Most caddisflies construct protective, tube-shaped homes from small pebbles, pieces of wood, and other particles. 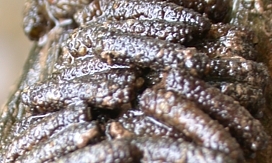 Caddisfly larvae use many different feeding strategies, depending on the species. Some are predators who feed on other small aquatic organisms. Others are "scrapers" who scrape algae from the surfaces of underwater rocks. Some species, called "net-spinners," construct a silken net and hold it in front of their case, capturing particles of food from the water as it flows by. 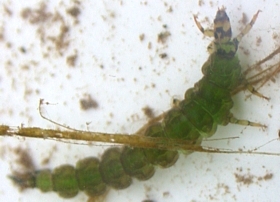 Caddisfly larvae are an important part of stream ecosystems, where they help control algae populations and provide food for fish and other creatures. In healthy streams, caddisflies are usually very common and their cases are found by the hundreds under rocks and logs. Unfortunately, many streams in Kentucky are polluted with sediment or have low oxygen levels and cannot support caddisfly populations. Caddisflies are not considered pests. Most Kentucky caddisflies are "case makers." Their larvae use silk to make cases of pebbles and other aquatic particles. In clean, healthy streams, they are very common under rocks and logs. There are several dozen species of case-making caddisflies in Kentucky. Common case-making families include Hydropsychidae, Lepidostomatidae, Leptoceridae, and Limnephilidae. A few species of caddisfly larvae do not construct cases. Most of these species are predators. Free-living caddisflies are not as commonly found as case-making caddisflies. Some free-living caddisfly larvae grow to nearly 1 1/2" long. Free-living caddisflies are sometimes called "primitive caddisflies" and belong to the family Rhyacophilidae. Many species, like the one pictured below, are called "green caddisflies." Caddisfly adults are difficult to find because they are only around for a few weeks each year. Look on rocks and logs near streams in the spring and early summer. Caddisfly larvae can usually be found under rocks year round in clean, fast-flowing streams. Adults and larvae are typically slow-moving, making them good subjects for photographs. Do you know any myths, legends, or folklore about caddisflies? If you do, let us know!